Cowley College vice president of institutional advancement Dr. Kori Gregg served as emcee for the evening and thanked those in attendance for their support. “Every day we see students who benefit from your donations. You are making a difference in their lives,” Dr. Gregg said. Over the past year the college had in excess of 200 donors and this fall the school was able to provide almost $160,000 worth of scholarship support to more than 150 students. “Your donations and contributions, along with your time and effort, help answer the call for hundreds of students that otherwise could not afford college,” Cowley College Foundation Board vice president Mike Munson said. 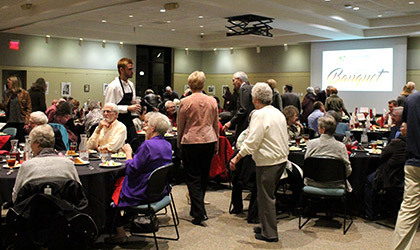 Great Western Dining provided a wonderful dinner, while music was provided by Cowley College freshman Jacob Edelman. Following the banquet, Cowley College’s Theatre Department performed “Mary Poppins” in the Robert Brown Theatre. 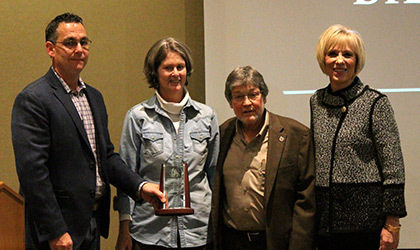 During the banquet, Munson presented the Ambassador Award to Bill and Judy Docking. 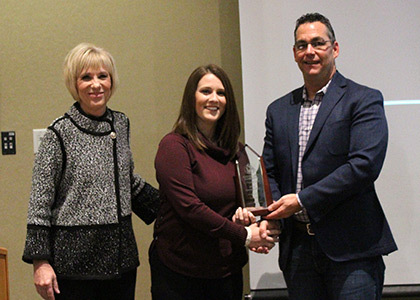 The award recognizes individuals who have given significant volunteer and other contributions to both Cowley College and the community, and consistently give of themselves and their time to make the community better. Bill and Judy were married in 1995. Judy is a graduate of Pioneer Technical School in Ponca City, OK. Following graduation, she spent more than 10 years as a labor and delivery nurse. Bill is chairman of Union State Bank in Arkansas City and City Bank & Trust Company, Guymon, OK. He is also chairman, president and CEO of Docking Bancshares, Inc., a bank holding company, and is president of Cowley County Broadcasting, Inc., which owns two radio stations. An attorney and certified public accountant, Docking has distinguished himself as a businessman, a community leader, and a friend of Cowley College. Although he has three degrees from the University of Kansas, he and his wife Judy have generously supported Cowley College. Docking’s support of community has led to extensive service throughout Cowley County and Kansas. He is also a member of Cowley College Foundation’s Board of Directors. Brice Harader-Pate was then announced as this year’s recipient of the Young Achiever Award. The award recognizes individuals age 40 or younger that have had success in their educational achievements, careers and community service, and/or service to Cowley College. Harader-Pate graduated from Cowley College in 2005. She went on to receive a Bachelor’s of Science in Biology from Northeastern State University, a Bachelors of Nursing from the University of Oklahoma Health Sciences Center, and a Master’s of Science in Nursing from the University of Oklahoma Health Sciences Center. She is pursuing her Doctorate of Nurse Practitioner with an emphasis in Acute Care from Vanderbilt University, and currently works as an APRN in the emergency room of St. Francis Health Care in Tulsa, OK.
She is a member of the Emergency Nurses Association, American Association of Emergency Nurse Practitioners, SkillsUSA, and the Medical Reserve Corps. She has traveled to Peru to serve on medical missions for the last three years and this year will travel to Kenya for yet another mission trip. Also during the banquet, a video was shown featuring Foundation Scholarship recipients Corey Firebaugh, Tyler Kurtz, Tara Lukert, Katherine Adams, and Felipe Escalante. The Foundation Scholarship recipients thanked the donors in attendance for making their scholarships possible. To donate to the Cowley College Foundation, contact Dr. Kori Gregg at 620-441-5245 or go to www.cowleyfoundation.org/donate.